The Context Menu is familiar to all computer users. It is often helpful and gives more options almost anywhere on the screen. The context menu of SAP Business One is, as expected, immensely helpful. In several articles we talked about some functions, such as cancel and reopen, which can be found in the context menu, but those are not the only options in SAP Business One. To look at all the context menu functions in SAP Business One, besides right-clicking everywhere, users can go to “Go To” in the bar menu. If the user checks a document, the Go to menu will give the available functions and grey out all the unavailable functions. Here are some useful functions. Duplicate copies all the items and give a new posting date. This function can be useful if the user has plenty of items and the document isn’t recurred seasonally. If the user needs a recurring document, Recurring Transaction Templates may be a good choice. 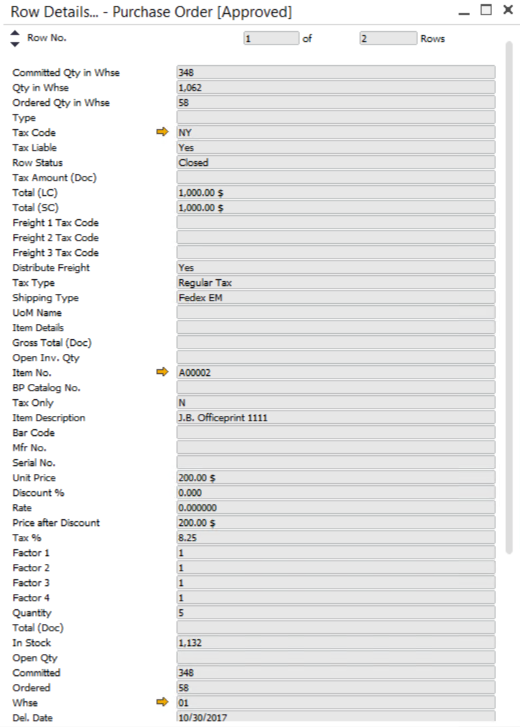 Row details gives all the details about the corresponding item and document. Sometimes the columns of table aren’t enough and the user doesn’t want to expand too many columns. Open Row Details to find information can be helpful. These two functions can be found in most documents. There are many other functions in the Context Menu. Click around to find them! If you are interested in CRM System or Activity Status, please visit Activity Status in SAP Business One.